For soldiers in remote or “disconnected” environments, video content must be delivered securely and it must be tailored based on roles, missions, and other factors. Previously, troops stationed around the world would struggle with distribution and network connectivity challenges that prevented them from accessing military command videos, training videos, entertainment, or even the ability to call home. With the launch of AWS Media Services, government and military agencies can bring connectivity to the edge. To be able to distribute massive amounts of video data quickly and securely, agencies can integrate in-console video services with on-premises solutions or connect them with other AWS services to build complete, end-to-end video workflows in the cloud. 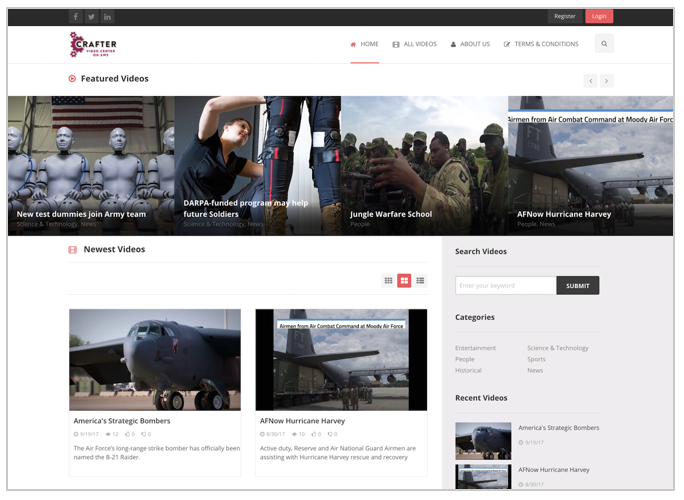 For example, an AWS Media Services deployment for the military and government is Crafter Software’s Video Center on AWS. By using AWS Elemental services and the AWS Cloud, agencies can deliver secure video to deployed units anywhere their mission takes them. To make this possible, Crafter Software’s Video Center runs on hardened, physical servers that combine compute, storage, and other AWS capabilities to provide either cloud-driven or fully disconnected content distribution for education, training, task-enablement, communication, and entertainment. Video files are transcoded using AWS Elemental MediaConvert and then stored in Amazon Simple Storage Service (Amazon S3), while video metadata is stored in the Crafter Software’s Video Center content management system (CMS). The solution securely serves video anywhere to any device with role-based permissions, dynamically transcoding for specific devices and bitrates as needed. It also integrates with strong authentication and authorization for increased security. Crafter Software’s Video Center on AWS personalizes targeted content and video based on role, region, rank, mission, and other factors, easily scaling with elastic AWS infrastructure. Challenge: Provisioning on-premises hardware in remote field operations presents capacity challenges for defense agencies to deliver video-on-demand (VOD). Operating bases may also lack the resources to meet peak demand. Solution: AWS Elemental MediaConvert allows customers to focus on delivering media experiences without the complexity of building and operating video processing infrastructure. The service combines advanced video and audio capabilities with a simple web interface and pay-as-you-go pricing. Challenge: Content can be sourced anywhere in the world and must be transmitted and processed securely, with high reliability, high quality, and minimal latency from troops on the ground to analysts in other countries. Solution: Create high-quality video streams for secure, real-time uninterrupted streaming of mission-critical applications in the field with AWS Elemental MediaLive. The service works by encoding a live video stream, such as tactical video, in real-time and compressing it for distribution. Challenge: Existing origin, packaging, and rights management solutions require complex, expensive integrations that cannot scale with demand. It is also a challenge to convert video content from a single input into multiple outputs for delivery to devices, such as PED consoles, tablets, and smartphones. Solution: AWS Elemental MediaPackage reliably prepares and protects video for delivery over the Internet. Just-in-time packaging with broad DRM support reduces cost and complexity, and better protects streaming content without the risk of under or over-provisioning infrastructure. It scales automatically in response to load, so viewers will get a great user experience. Challenge: Performance is critical, and real-time video distribution generates a huge volume of read and write storage requests, with multiple requesters potentially accessing the same content simultaneously. Solution: AWS Elemental MediaStore’s high-performance capabilities meet the needs of the most demanding media delivery workloads, combined with long-term, cost-effective storage. When a video file is written to AWS Elemental MediaStore, it is automatically held in a replicated cache after creation, and again after each update. This replicated cache gives great performance, even with high request loads and with the frequent updates common to video files. Challenge: A large video content library can render content management too cumbersome, hinder navigation, and suppress engagement. Agencies need personalization of viewing experiences to role, rank, mission, and other significant metadata to optimize utility and increase engagement. Solution: When tied to a personalization engine, AWS Elemental MediaTailor can personalize video content to an individual and optimize engagement and productivity. Learn more about how you can bring AWS Media Services to your agency by downloading the solution brief here. Or to ask a question, arrange a consult, or start a trial or a pilot, please contact us.